A major factor that determines how long your roof will last is ventilation. If the Roof is not properly ventilated the extreme heat in the summer and condensation in the winter can significantly shorten the life-span of a roof. Many “Builders Grade” Roofs should last 20 years, but by no properly ventilating the roof homeowners often end up replacing the roof before it is 15 years old. Why does ventilation play such an important part in the lifespan of a roof? 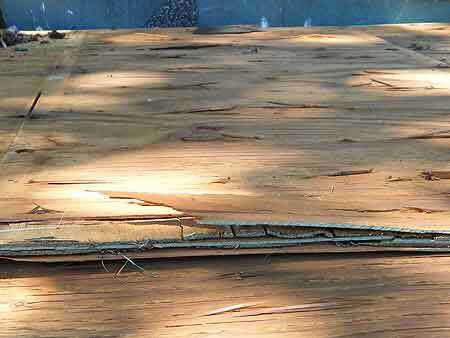 The moisture(humidity) will condense at a cool temperature causing damage to the wood decking. The average household produces over 4 pounds of water vapor a day. When hot air and moisture rises and has no where to go it condenses on the underside of the plywood sheeting of the roof, causing the plywood to expand and delaminate. Damaged plywood will loosen the nails holding the shingles in place and can add thousands when the rotted plywood has to be replaced.